As you can tell from the name, it is for cutting hair on the head as well as the face. You can use it to trim and style your mustache, beard, jawline and sideburns. It is similar to the 80 S from Panasonic but this one is a lot cheaper than that one. They have a lot of similarities such as the running time is 50 minutes and both of them are cordless trimmers. They both have Ni-MH batteries and they have washable heads which makes it easy for maintenance. The difference between the two models is the reason why the rise in the price occurred. 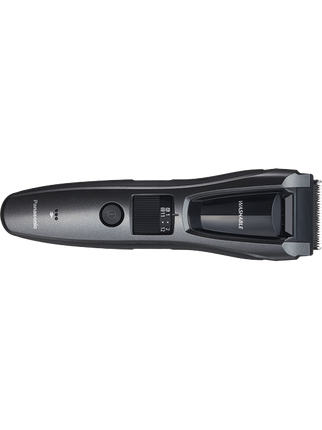 The GB 80 come with an add-on for grooming hair on the body and it has a pop-up trimmer which can be used for a detail trim. The device uses a, super-sharp and durable 45-degree angle blades crafted from stainless-steel to cut rapidly and effectively for non-irritating and efficient beard and hair trimming. The facial hair trimmer regulate dial for adjustments and two comb attachments for thirty-nine tailored beard and hair settings. The tool comes with an Ergonomic design and a rubberized handle making it suitable for control and comfort. You can wash it under water. It can work as a cordless beard trimmer for 50 minutes. You can use it as both cordless and a corded one. The manufactures put in reliability, portability, quality, and anywhere, anytime, the trimmer can be functioned by plugging into any AC outlet or cordlessly. The multipurpose, powerful, grooming tool also features worldwide voltage for trouble-free grooming when you are traveling to another country. Panasonic is a famous and a brand known internationally for its merchandise and electronics. That is why you can use their tool anywhere in the world. The blades come from hypoallergenic and stainless steel to ensure harmless, non-irritating cutting on sensitive skin. If you need a beard trimmer that takes care of delicate skin, you should pick this one. The 39 settings offer a lot of options for men who wants to style their beard any way they want. It can get the short beard look or stubble to a long beard look. There is a LED light indicator that tells you about how much you need to charge it. It takes only an hour to charge to operate for more than 50 minutes. Nobody complained about the beard trimmer but they said they had problem with the charger. One of the customers from the United States was unable to charge it because it had an European charger. As a result, he called the customer service but their behavior was bad. Customer service is poor. It is sad when such a renowned company has poor customer service.